What is the Pup’prentice Project? [The next Pup’prentice Project is scheduled for March 2017. The Pup’prentice Project is a program created specifically to prepare people and their dogs for the therapy dog test. It is customized for people who would like to do volunteer work with their dogs as a therapy dog team. It is our hope that people who participate in the Pup’prentice Project will train and prepare their puppy to be a great family dog, will have good public etiquette and will give back to their community as a therapy dog team by volunteering with programs such as Reading with Rover. 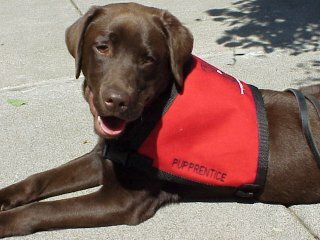 While enrolled in the Pup’prentice Project, your puppy will wear a training vest and train in public places. You and your canine partner will learn how to navigate in public and maintain good manners. You will have a Pup’prentice Project badge identifying you and your puppy as a registered Pup’prentice Project team. The Project requires a three-month commitment during which you will be introduced to the skills required to pass the therapy test. You will receive continued hands-on support and email support from your mentors during and following field trips. Some of your field trips will take place at a mall where we will set up a mock reading session with children at the Reading With Rover room at Redmond Town Center Mall. We even meet up for dinner with our partner pups! Other events will be available as well where you can practice with your canine companion in public. We started our puppy, Jett, in the Pup’prentice Project when he was 6 months old. We are hoping for him to be a therapy dog like our other dog, Si. We plan to take them both to Reading with Rover. As teachers, we have experienced the benefits of the Reading with Rover program. The Pup’prentice Project has been a fabulous experience for our dog and for us. The field trips and classes have made all the difference in the world and we are confident Jett will pass his therapy test at age one. And, as a bonus, it’s given us a wonderful, well-rounded puppy at home. That alone is worth joining the Pup’prentice Project! Additionally, you will attend monthly Pup’prentice Project meetings where you will practice the various elements of the therapy test and roll play in therapy situations with trainers who are pet therapy dog evaluators. After completing your Pup’prentice Project, you will receive a coupon for a discount to a therapy class or seminar. Once you have completed your Project, taken the therapy class, and your puppy has reached at least one year old, then you and your puppy may take the test to become a registered therapy dog team. When your puppy reaches one year old and has completed a therapy class, he should be well-prepared to take and pass the Reading With Rover pet therapy evaluation test! Pup’prentice Project dogs are expected to maintain their training during their participation in the Pup’prentice Project and beyond at least until they are one year old. Being a Pup’prentice also has it’s perks! You will receive discount coupons good at any of our network vendors. When can my puppy/dog take the pet therapy test? Your dog must be at least 1 year old to take the therapy test. After the Pup'prentice Project, you may take a therapy class or work shop (see coupon) that will prepare you to take and pass your pet therapy test. What is the minimum age my puppy must be to participate in the Pup’prentice Project? Puppies must be at least three months of age. Puppies over 24 months of age do not qualify for this program but we are happy to offer you options. While three months seems so young, it's such good socialization for a puppy and a great experience for the handler. Even if you don't become a therapy dog team, puppies are better for the social experience through Pup'prentice. Being a part of Pup'prentice is not a replacement for training. We want you to be enrolled in puppy/dog training classes as well. Homeschooling your puppy is fine as long as you are meeting their socialization needs. We are excited to help coach you along this journey and it will be fun! We will be meeting up for a field trip (sometimes TWO!) each month. Please check the schedule on this website for the meeting and field trip dates and times. The website will have the most current information and is available to you 24 hours each day. Holidays may affect our meeting days. Always refer to this website and the schedules to learn the latest information about meetings, field trips and news. If you are interested in your puppy or young dog entering the Puppy Manners Pup’prentice Project, please call 425.482.1057 or email info@puppymanners.com for more details. The latest information is always available at www.pupprentice.com.